Traditional brick-and-mortar retailers have been investing in these blown-out, pull-out-all-the-stops projects for decades, often times knowing they won’t be profitable dollar-wise but with the expectation they will be profitable in brand equity. These stores are typically high budget and high-profile, gracing the most sought-after retail real estate in the country. These premium locations host world-renown brands, high foot traffic, and prestige. On the flipside, Digitally Native Vertical Brands (DNVB’s) have the advantage of novelty, racing on to the scene and drawing fans and potential new customers to their first brick-and-mortar stores, sort of a permanent Pop-Up. Their newness gives them Destination credibility without the massive investments by traditional retailers. What makes a Destination Store worth visiting? Everything about this store should amplify the company’s brand position, or what the brand aspires to be. A Destination Store will bring in droves of people, some already loyal to the brand and some that are not. Cement the relationship with brand loyalists and gain a new customer. The physical store should wow people as soon as they see it. Ideally, the architecture should be a beacon seen from a distance, creating a memorable facade that speaks to the brand essence. If the store is in a location where the facade can’t be altered, the interior of the space should capture attention upon taking the first steps inside. Materials used are typically authentic and high end, mirroring the quality the brand. Memorable experiences bring customers into stores and keeps them coming back. Interactive digital displays, selfie snaps and virtual reality are just a few striking tools used to create these experiences. And good ‘ol visual merchandising continues to play a key role in telling stories about featured products. Bottom line: Your store should become a product playground for shoppers as they uncover features and options. Whether it’s designing a shoe at a kiosk that’s shipped to your home or buying a phone case with the selfie you just took, creating something engaging and playful will create stickiness with the brand. This is also an opportunity to introduce a new product launch or upgraded existing products. The grand opening of a Destination Store is a big PR opportunity. Building hype through advertising and “coming soon” moments will pay off when the ribbon is cut. Brands will go to great lengths to capitalize on the event by hiring a celebrity or band to usher in the \crowd on opening day, building anticipation and adding to the excitement and PR. The social media buzz is critical in getting the word out and rallying a large crowd. DNVB’s, on the other hand, can exclusively use push notifications, social media and influencers to alert their loyalists to the opening of the store, while those unaware of the brand can be reached by more traditional advertising channels. Mandate that these stores make money. Since people often visit Destination Stores when they are traveling or on vacation, make free shipping to your customers’ home available. Retailers should also be cognizant of international travelers, ensuring employees can process foreign transactions, or their products will be waiting for them when they get home. Specialized local branding or limited time offers can create collectables to commemorate the trip to the store and enhance the overall experience. 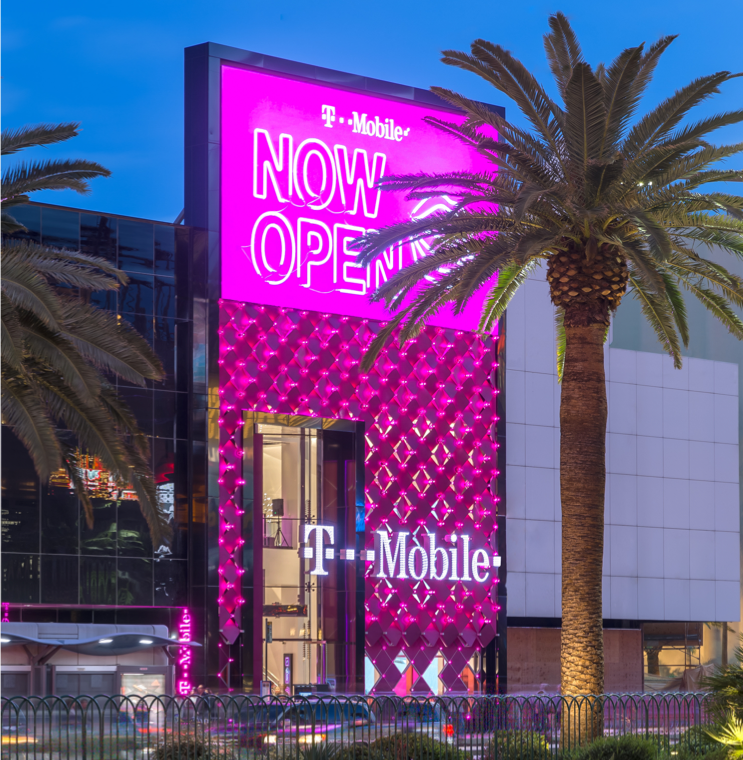 T-Mobile offers a custom cool drink and a branded power supply to juice up your phone after an active day on the Las Vegas Strip. It’s all about human interaction and the people working the store are the human element that pulls everything together. Training of employees for this specialized store is critical to its success and may be a much different environment from their previous work experience. For example, they may not be on commission, or they may need to get up-to-speed on specialized products sold only at this store, or understand how to navigate a digital kiosk used to customize and ship product. They will be specially trained to interact with your customers and guide them through the new experiences, and should embody the brand in both attitude and uniform. Employees don’t just know the product, they know what makes this store truly special and different, and are passionate about the brand they represent. Whether its social media equity or word of mouth, these stores (if they do their job) will offer people memorable experience, add to your loyal following and convert customers.